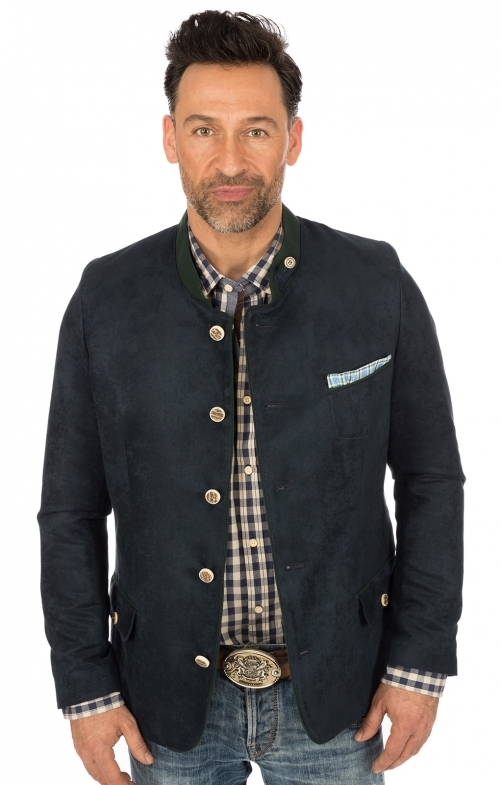 Traditional jacket in a young casual style. Colour marine. Slim Fit Fit. A great cardigan from the house Orbis costumes. Perfect styling in the combination of tradition and trends in jackets. Traditionally, the subtle colour elements are like pine green stakes with the buttoned machine or the jackets and pocket facing. Of course, the real stag horn buttons. Young is the presentation in a trendy slim and body-hugging shape, the modified breast pocket with the pocket handkerchief with which the cardigan is lined inside and last but not least the fashionable smooth back with the green contrasting piping. The material is in suede look but significantly lighter and less sensitive. A jacket for the leisure and also for the business occasion. Die Jacke sitzt perfekt und ist sehr schick. Die Lieferung erfolgte sehr schnell. Ich bin sehr zufrieden! Ich bestellte die falsche Größe, der Laden bat um einen Ersatz. Danke!